Swedish Bitters and Swedish Herbs. Concentrated liquid and dry do it yourself mix. 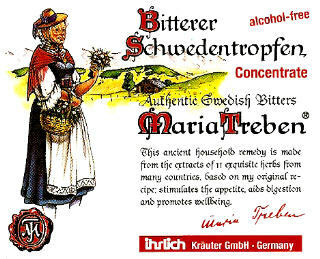 Authentic Maria Treban products from Germany! Swedish Bitters (also known as Swedish Herbs) have been around since the middle 1500's! This mixture was invented as a digestive supplement, but it's effects far outweigh the original intent a thousand fold! Swedish Bitters are one of the best known herbal remedies world wide. The knowledge of Swedish Bitters as an herbal remedy was brought to the public's eye by writings of the famous Austrian herbalist, Maria Treben, in her book " Health Through God's Pharmacy". 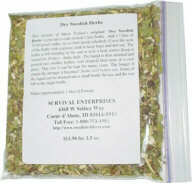 Maria explains how she came to use this age old remedy to treat hundreds of ailments. How to make your own "super powered" Swedish Bitters! Ingredient list: Angelica Root, Theriac, Rhubarb Root, Myrrh, Zedoary, Carline Thistle Root, Champhor, Aloe, Manna, Senna Leaves and Saffron Powder. Make your own "super powered"
Ingredient list: Nutmeg, Wormwood, Angelica Root, Theriac, Rhubarb Root, Myrrh, Zedoary, Purified Infuscial Ground Earth, Gentian Root, Alumina Red Clay, Carline Thistle Root, Mace, Champhor Powder, Raiz de Tormentila, Senna Leaves and Saffron Powder.